For over ten years AAANM has annually celebrated the diverse Asian cultures by hosting the Festival of Asian Cultures. Additionally, AAANM has spearheaded efforts in building an Asian American Cultural Center (AACC). Planning, design, and fundraising efforts are in progress. We’ve recently begun co-hosting with New Mexico Asian Family Center Community Movie Nights. Check out our calendar for upcoming events. Outstanding Asian Americans are honored every other year during Asian Heritage Day at the State Legislature. We worked closely with the City of Albuquerque in expanding and advancing the Metropolitan redevelopment area in Southeast Albuquerque. AAANM worked with our Legislators, Councilors, and Neighborhood Associations in renaming this area as the “International District”. This once blighted area is on the upswing as businesses are re-energized and economic growth is promoted. We are helping people find jobs and assisting small business to get started. We are actively involved in the International Day celebrations to promote and nurture cultural diversity, and social and economic growth. AAANM and organizations nationwide joined Racial Equity Here, a national movement that commits to the advancement of racial equity for all communities. 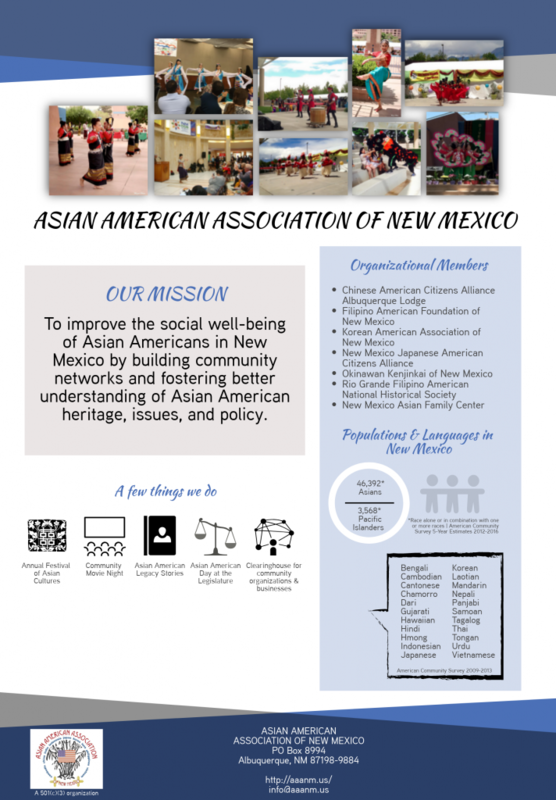 We founded the New Mexico Asian Family Center, a non-profit organization that provides direct social services including counseling to abused women, develops and implements anti-smoking projects and handles responsible gaming counseling in our Asian communities. Grants from Stop Tobacco On My People (STOMP) have enabled us to organize antismoking programs and projects for our youth. Through a mini grant (Healthy Kids NM) from NM Department of Health, AAANM completed a project ‘Healthy Asian American Children’ that took place from late 2009 through May 2010. The project focused on creating healthy environments that motivate children to change behaviors through healthy eating practices, dancing as a fun form of exercises, and parental involvement in project activities. The project enhanced the organization through (1) capacity-building for teens and youth, (2) building a healthy Asian American community for youth, and (3) networking across Asian cultural groups. During the early months in 2010, through a mini grant from NM Department of Health, AAANM embarked on a Hepatitis B Project to impart awareness to Asian communities about the nature, risk, preventive measures, and treatment of Hepatitis B, which plagues ten percent of Asians. The project was achieved through lectures and informational brochure. 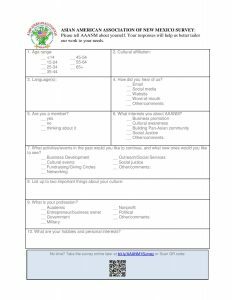 We are in the process of gathering data from our community to best determine what you’d like to see from the Asian American Association of New Mexico. Give us your feedback by clicking on the survey below!